Starring: Emma Watson, Ellar Coltrane, Glenne Headly, Bill Paxton, Karen Gillan, Tom Hanks, and more. We live in an age of technology. Faces in phones, tablets and laptops in our bags, checkouts at stores through iPads. Tech is everywhere and anywhere being used by toddlers all the way to the elderly for hours upon end. Now let us imagine the tech giants like Google, Apple, and Samsung running everything (kind of like they already do) and having their influence on everything and I mean everything. Well, then you have ‘The Circle’. ‘The Circle’ lets technology have no boundaries and we see the “what if” concept of technology and social media running rampant. So, after re-reading my little intro, I am realizing I just easily made this movie sound way better than it actually was. Well, now read on and see what I mean. ‘The Circle’ is about to get Oberrated. There was far more bad than good when it comes to ‘The Circle’, in my opinion, but I will start off by saying it was not an utter failure. If anything, I can fully appreciate the message the film is trying to deliver, and I put emphasis on “trying”. The message of the film portrayed the possible direction the world is going with social media and technology in general. A “what if” scenario of allowing tech giants to become more powerful and continue to be invested in almost every facet of everyday life. For the purpose of the film alone, it saves itself from being a 1/10 because I can at least appreciate message. Alright well, as for everything else, it was overall garbage. Piggybacking on my previously stated “what if” scenarios; the extent the film goes was so far beyond the possible future, it caused me to sit in my seat going, “what the f*$(?”. It delves so deep that the company, The Circle, is able to force individuals to create a circle profile, forces individuals to vote, and virtually eradicate any form of privacy. Which again, I appreciate that it is showing the extremes of what is actually happening to a degree in today’s society, but it is too far fictitious for me to be on board with what was portrayed on screen. The characters within the film were so hollow to me, I honestly did not care much for anyone. Even the always delightful Emma Watson playing the lead role of Mae. I came to understand why Emma would be in such a role though, because she has gone on record to explain how much she dislikes media, tech, and paparazzi, but besides bits and pieces of Mae’s portrayal, there were not many points during the film where I truly felt for the character. Beyond Emma Watson, all other characters seemed very dry to me, including Tom Hanks, Karen Gillan, and John Boyega. Taking the cake as possibly the worst performed role was Ellar Coltrane playing Mercer. Ellar’s most notable role was as Mason in the Oscar nominated film ‘Boyhood’ but since then, he has not landed many roles and after watching this film, you can see why. I personally loved ‘Boyhood’ but this role was not a shining moment for Ellar. ‘The Circle’ is a film that tries to be more intelligent than it actually is. While possessing a quality message and material to potentially make a gripping and mysterious film, it falls short with hollow and forgetful characters/performances, wildly off-the-wall concepts, and many plot holes and questions that can be formed with no answer to them. While I have no knowledge of the novel, I would imagine it being significantly better than this film-adaptation. A nod for the message ‘The Circle’ intends to convey but a disappointed walk-out by the time the credits roll. 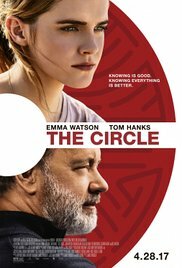 Posted in 2017 Movies, Movie Review.Tagged Ellar Coltrane, Emma Watson, James Ponsoldt, The Circle, Tom Hanks.